BERLIN: Interior Minister Thomas de Maiziere said he was against Turkish ministers holding political rallies in Germany, and signalled that there are legal ways to stop such campaigns. "A Turkish campaign has no business being here in Germany," he told public broadcaster ARD yesterday, saying he is "strongly opposed politically" to such events. German local authorities this month scrapped such campaign appearances over logistical problems, sparking an angry response from Ankara, which is keen to win votes from the Turkish diaspora. The row escalated sharply at the weekend after The Netherlands refused to allow Turkish ministers into the country for rallies. De Maiziere said while he is opposed to such appearances, the question of whether to impose an outright entry ban requires careful consideration. "But there are limits -- clear limits, for example in the criminal code. It is hardly noticed," he said. "Someone who insults and maliciously condemns Germany or its constitution has committed a criminal offence. That would at least be a limit," he said. 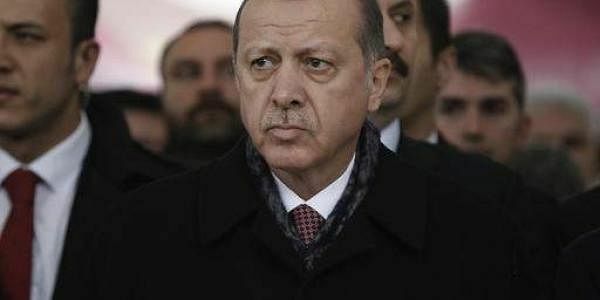 Erdogan had labelled the decision by German local authorities to halt the rallies as "Nazi practices", sparking consternation in Berlin. Chancellor Angela Merkel called such rhetoric "depressing", saying it belittled Holocaust victims and was "so out of place as to be unworthy of serious comment". But on any future rallies, she said: "We continue to view such appearances by Turkish government representatives as possible as long as they are duly announced, in a timely manner, and in an open way." Separately, Finance Minister Wolfgang Schaeuble said he hoped Turkey "would return to its senses." Through the dispute, as well as Ankara's arrest of a correspondent of German daily Die Welt, Schaeuble said: "Turkey and those responsible in Turkey have destroyed the basis for further progress in cooperation." The latest row over rallies is one in a long list of issues surrounding human rights and freedom of expression that plague Ankara-Berlin ties, particularly since the failed military coup against Erdogan in July.